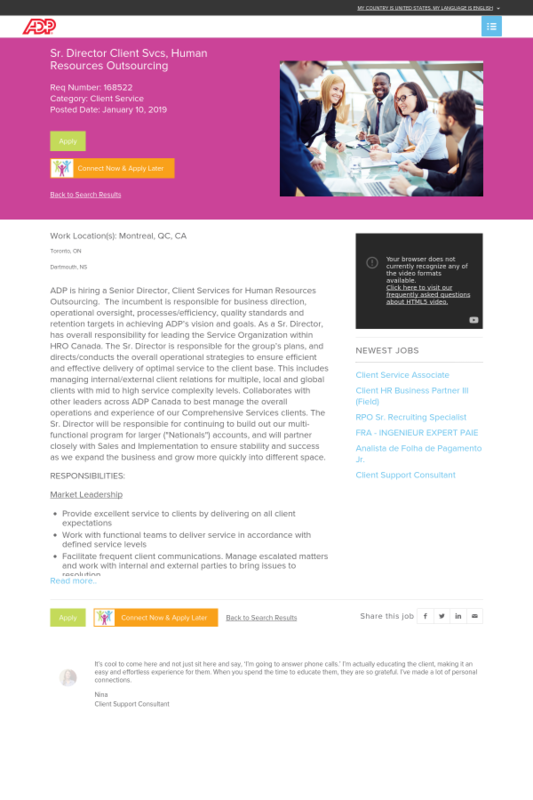 ADP is hiring a Senior Director, Client Services for Human Resources Outsourcing. The incumbent is responsible for business direction, operational oversight, processes/efficiency, quality standards and retention targets in achieving ADP’s vision and goals. As a Sr. Director, has overall responsibility for leading the Service Organization within HRO Canada. The Sr. Director is responsible for the group’s plans, and directs/conducts the overall operational strategies to ensure efficient and effective delivery of optimal service to the client base. This includes managing internal/external client relations for multiple, local and global clients with mid to high service complexity levels. Collaborates with other leaders across ADP Canada to best manage the overall operations and experience of our Comprehensive Services clients. The Sr. Director will be responsible for continuing to build out our multi-functional program for larger ("Nationals") accounts, and will partner closely with Sales and Implementation to ensure stability and success as we expand the business and grow more quickly into different space. Manage client relationships by working closely with the Relationship Managers, to ensure strategic matters are addressed and resolved in a timely manner. Manage client SLAs and internal targets to ensure metrics are achieved. Responsible for achieving NPS, internal quality, and client retention targets. Participate in organizational planning to support new clients, and ensure organizational protocols and preparedness is in place to support rapid growth while fostering strong client and associate engagement/satisfaction and retention. Develops and/or implements policies and procedures that support client service, payroll processing, HR Services, technology support, and employee service center operations. Foster associates to learn, develop and adapt to constantly changing work environment and lead by example through the ADP Values. Provide leadership skills that support the organizational goals, value and mission by effective and frequent communication. Recommends and executes new methodologies and processes to increase quality, operational efficiencies, associate productivity and profit margins. Ensures productivity measurements are achieved. Analyze data and makes ongoing adjustments to achieve desired business results. Looks for innovative ways to improve service delivery and productivity. Identifies opportunities to maximize revenue and ensure effective expense management. Identifies opportunities for better utilization of technology and business process improvement to deliver upon the required business results and ensures successful implementation of appropriate solutions. Bachelor’s Degree in Business Administration, Human Resources or the equivalent. A "servant leader" who is able to work well in a high demand, fast paced environment and can easily move from setting strategy to rolling up their sleeves to get into the details. Must possess strong business and financial acumen, able to lead with business metrics to manage processes, budgets and people. Must possess excellent communication, presentation, negotiation and facilitation skills and recognized organizational savvy. Ability to manage organizations cross-functionally (matrixed) successfully.